The editor of two regional dailies has quit his role to move back to his former patch after just nine months in the job. Colin Channon, left, is stepping down as editor-in-chief of the Echo, which serves South Essex, and sister daily the Colchester Gazette, having taken over from long-serving predecessor Martin McNeill in January. A memo sent to Newsquest Essex staff last week by managing director Michael Harper put Colin’s departure down to “personal reasons” but it has since emerged that he has a new job. He is moving back to Hampshire near to where he was previously based as editor of the Chichester Observer to take up a role of head of editorial at Car Dealer magazine, based in Gosport. The announcement came shortly after Newsquest Essex, which owns both titles, told its photographic staff at a meeting on Monday that it is planning to merge their operations, leading to the number of photographers being cut from 11 to eight across the county. Colin’s role is also being split, with separate editors appointed for the Gazette and the Echo, which mainly circulates in Basildon and Southend. Chris Hatton, deputy editor on the Echo, has been appointed editor-in-chief for South Essex and editor of the Echo. James Wills, currently editor of the Essex County Standard and head of content for the Daily Gazette, will become editor-in-chief for North Essex and editor of the Daily Gazette. In the memo, Michael states: “I know this has been a very difficult decision for Colin, but one he has had to make in the interests of his family. “I would like to take this opportunity to thank Colin for the contribution he has made to the business in his time with us and to wish him every success with his plans for the future. “As a result of this, in order to give greater focus to the titles in our portfolio, it has been decided that the role of editor-in-chief will be divided between North and South. “Further to these appointments, and in line with our plans to simplify the editorial production process, Neil Reeve, currently production editor, will become the deputy editor for the Echo. “Other changes resulting from this re-organisation will be announced in due course. The management changes will be implemented from 10 November, although it is not yet known when the photographic changes will take place. Colin started his career started at The News, Portsmouth, before he moved to The Evening Herald, Plymouth, as deputy sports editor, followed by a return to Portsmouth as sports editor. He replaced Martin at Newsquest Essex who retired after more than 40 years in regional journalism, 23 of which were spent as a daily editor in Essex. 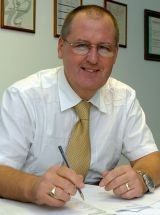 Both Colin and his predecessor also held overall responsibility for weekly titles including the Essex County Standard, Clacton and Frinton Gazette and the Harwich and Manningtree Standard. Colin’s new role will also involve overseeing Car Dealer owner Blackball Media’s online content on its various automotive industry websites. Speaking about the move, Colin said: “I’ve worked with some of the best journalists in the business during my career – I must have done because almost all the publications I’ve been at have won awards, and there’s no way I’m the reason why. Separate editors for papers. Sounds better than these group editors some of whom do little hands-on production work and spend most of their time in meetings. Good luck Colin. Wise move to get out of papers. Editors should be like football managers, if they aren’t hitting the target, get rid. I’ve worked with too many at various papers who don’t manage their staff, get them motivated or respond to problems. They then sit down with them to tell them of redundancies because the paper isn’t producing at the level it should. Whereas the reason why that happens is because the editor has not watched the ball. My comments are not related to this story just wanted to air views on editors in general. As you say, Gentleman Jim, not related to this story. I gather the Echo sales have actually increased year-on-year and not many papers can show that. As it happens I know a little bit about the operation down south where this chap is going. Run by an ex JP person, I believe, world wide connections, premium placed on creative quality, loyal staff, treated well. Turns a profit and no Plc-type shareholders to placate. Can quite see why someone would want to leave death by a thousand cuts and sign up for some sanity. The Echo has improved a heck of a lot over the last couple of years. Mr Channon was part – but not all – of that. Good luck to Chris Hatton, though – he’s got to make sure his paper keep hitting the high notes, otherwise the Echo won’t have a squeak of a chance…and with Newsquest bosses being the way they are, it could end up like an episode of The Sopranos. Colin did wonders for the daily gazette, including opening up his weekly column for the readership to submit columns of their choice. I have had three columns published with another due shortly for which I will always be eternally grateful to Colin for giving me that chance to see my words published in a local paper read by thousands. THANK YOU SO MUCH COLIN. I wish James every success as he takes over from Colin and will continue to support him as I have supported Colin.